In less than five years, the Eagle Ford Shale has become one of the most drilled shale formations in the United States. The discovery well was drilled by Petrohawk Energy Corporation in 2008 in La Salle County, Texas. Thousands of wells have been drilled since then and the Eagle Ford Shale play – roughly 50 miles wide and 400 miles long – now stretches from the Mexican border across large portions of South Texas and up into East Texas. The Eagle Ford Shale is believed to have been formed in the late Cretaceous period and is estimated to be 89 to 95 million years old. More of a carbonate than a shale, the Eagle Ford’s carbonate content can be as high as 70 percent. The high carbonate content and subsequently lower clay content make the Eagle Ford more brittle and easier to stimulate through hydraulic fracturing. The formation rests in between the Buda Limestone below and the Austin Chalk above. It is considered the “source rock” or the original source of hydrocarbons for the prolific Austin Chalk play as well as the giant East Texas oil field. Since the first well was drilled in 2008, many companies have followed suit, most using the same horizontal drilling and hydraulic fracturing techniques to reach and extract oil and gas from the shale formation. It wasn’t until 2010 when drilling permits in the Eagle Ford Shale began to drastically increase. In 2010, there were more than 1,000 permits issued. By 2012, more than 4,000 permits were issued during the year. Since 2010, Eagle Ford natural gas production has steadily increased while oil production has grown exponentially from slightly over 100,000 barrels per day in 2011 to 600,000 barrels per day in 2013. 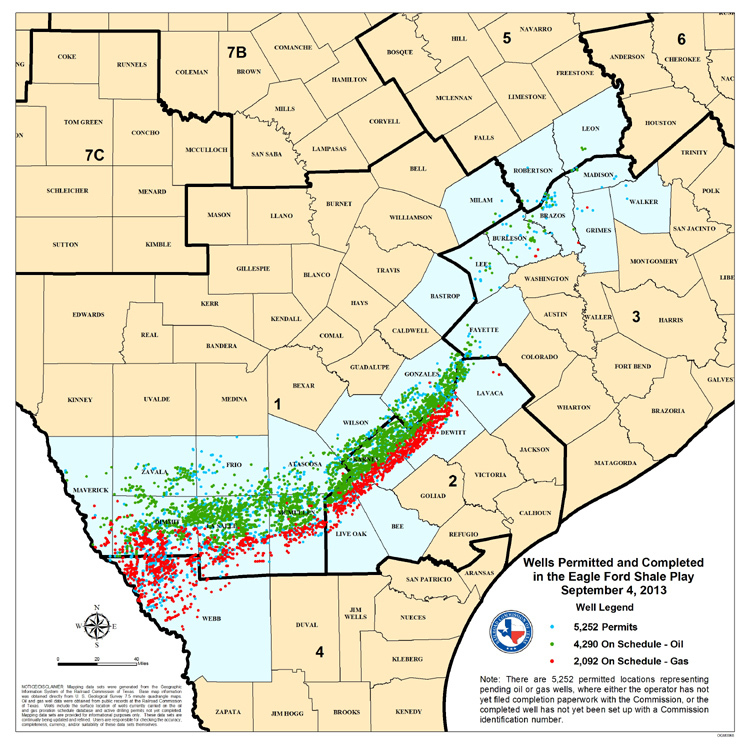 Today, the Eagle Ford Shale contains 22 active fields across the play. The Briscoe Ranch Eagle Ford field in Dimmitt County, Texas has 914 active gas wells that have produced over 500 Million MCF of natural gas, making it the largest single natural gas field in the play. The Eagleville Eagle Ford-1 field in Karnes County, Texas is the largest producer of oil with the greatest number of oil wells in a single field in the Eagle Ford Shale. The 2,204 oil wells in the field have produced more than 140 million barrels of oil to date.